The Los Angeles Lakers are really bad. Less than a week into the season they’re 0-4 and getting outscored by 17 points a game. But is this all a part of their … master plan!?!? That’s the theory that some of the best NBA writers in the business are talking about right now. SB Nation’s Tom Ziller wrote about it over the weekend and Grantland’s Zach Lowe mentioned it on a recent podcast. Before the season it was assumed that the Lakers would try to be good because they gave Kobe Bryant a massive contract extension last year. Also, they’re the Lakers. Tanking is traditionally a strategy for small-market teams that can’t land stars in free agency. No one thought L.A. would make the playoffs, but no one put them in the category of “tanking” teams (Philly, Orlando, Utah) that were actively trying to bottom out as part of a coherent long-term building strategy. What the secret tanking theory presupposes is, maybe the Lakers really are sacrificing the present for the future. 1. They spent the summer conserving future cap space. The Lakers went into the summer with enough cap space to sign a max-level free agent. When they missed out on LeBron James, Carmelo Anthony, and Chris Bosh, they used that money on … role players with short contracts. They agreed to take Jeremy Lin’s $US15 million contract from Houston, picked up Carlos Boozer on the waiver wire, signed Jordan Hill to a two-year, $US18 million contract (with the second year non-guaranteed), and didn’t do a whole lot of anything else. The only guy they signed to a long-term contract is Nick Young, and even that’s only a $US5 million per year deal. The Lakers only have $US36 million in salary on the books for next year. In the 2016-17 season — when the new TV deal is expected to send the salary cap through he roof — they only have two guys signed (Nick Young and Julius Randle) for a total of $US8 million. They could have chased Lance Stephenson or made offers to restricted free agents like Gordon Hayward, Eric Bledsoe, and Greg Monroe. Landing any of those guys could have made them a better team right away. Instead they gave short-term deals to Jordan Hill, Carlos Boozer, Ed Davis, and Wayne Ellington so they’d have maximum cap flexibility down the road. 2. They’re taking in draft picks instead of trading them. The Lakers, like many perennial contenders in big markets, have a history of trading away their draft picks in order to get contributing players right away. That’s not what happened this summer. They actually acquired a first-round pick from Houston in agreeing to take on the last year of Lin’s massive contract. 3. They have a strong incentive to be bad. This is where things get interesting. The Lakers have to be really bad this year or else they lose their first-round pick to Phoenix. The pick was part of the Steve Nash trade in 2012. If it’s a top-five pick, the Lakers keep it. If it’s sixth or later, the Suns get it. The Lakers were never going to contend this year, especially with Steve Nash out. The smart strategy is to play young guys, acquire draft picks if you can, and try to be one of the five worst teams in the league so you can keep your first-round pick. 4. They can’t openly tank. And this is where the “secret” part of secret tanking comes in. The Lakers have to give their fans hope that they will be good because of how their TV deal is structured. “One well-placed source who has reviewed Lakers team finances says the Lakers’ annual income from that [TV] deal hinges on ratings, which tend to go up when Bryant is on the court. If the team had jettisoned Bryant and tanked the past season in the name of a high 2014 draft pick, the resulting low ratings would have smacked the business of the Lakers hard. The Sixers are employing one of the most radical tanking strategies the league has ever seen, and they’re being completely transparent about it. Their fans, from what I can tell, are fine with it because the team is open about how they’re going about their business. But that doesn’t mean Sixers fans are watching the games. In fact, being so transparent about tanking tells their fans that what happens on the court doesn’t really matter for now, so there’s no need to watch. The Lakers need people to watch. They need to be bad, but they also need to make it look like they’re trying to be good. So how do you do that? 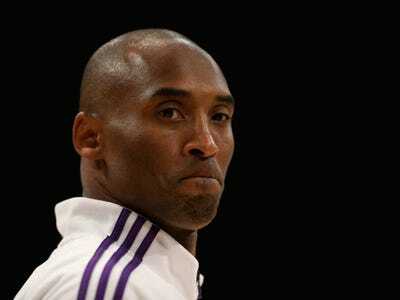 You make 36-year-old Kobe Bryant the highest-paid player in the NBA. You bring in veteran players with name recognition (Jeremy Lin, Carlos Boozer) who aren’t really suited to starring roles. You don’t address any of your your greatest weakness (defence, three-point shooting) during the offseason and hire a coach who’s using a prehistoric basketball strategy that analytics people hate. The Lakers are better off bottoming out this year, whether they’re doing it on purpose or not. It’s an unfortunate way for the Kobe era to come to an end, but it makes sense in the long run.